Jason is a "Rising Star" in the Annual Downbeat Critic's Poll. "The young Berklee instructor’s accomplished second CD, “Tipping Point,” on which his compositional voice is as distinctive as his virtuoso playing"
Jason Anick, an award-winning composer and one of the youngest violin professors at the esteemed Berklee College of Music in Boston, has shared the stage with an array of artists including Grammy award winning guitarist John Jorgenson, Stevie Wonder, The Jim Kweskin Jug Band, and Tommy Emmanuel. 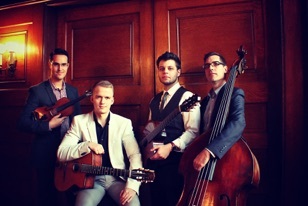 After relocating from Scandinavia Olli Soikkeli quickly became a top call guitarist in the bustling Brooklyn jazz scene. He has performed alongside Cyrille Aimee, and the celebrated guitarists Frank Vignola and Bucky Pizzarelli, and many prominent contemporary players. Rogério Souza is a pioneer in developing the style of music that is known today as “choro novo” – innovative interpretations of traditional Brazilian instrumental music while remaining true to the roots of the music. He performs regularly in music festivals, concerts, and workshops throughout Latin America, Europe, the United States, and Asia. His current show focuses on the art of Brazilian guitar and includes original works as well as classic repertoire. 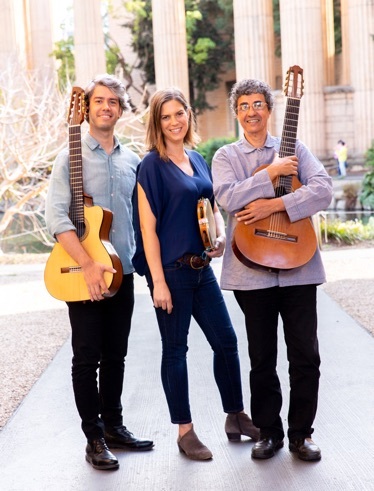 Along with performing, Rogério frequently gives masterclasses and workshops that focus on guitar styles and cover material from his latest books and CDs. Edinho Gerber possesses a rich musical vocabulary developed in the two countries where he was raised: the United States and Brazil. Navigating effortlessly between the genres of choro, jazz, samba, and blues, he is always in search of the intersection points within his dual cultural identity. A staple in the Chicago music scene for many years, he was a highly in demand sideman having played with countless U.S. based Brazilian groups, including Som Brasil, Renato Anesi Trio, A Cor do Brasil, and led the samba-jazz group Zona Sul. He has performed in prestigious festivals and concerts in throughout the United States, Russia, and Japan, and currently resides in Rio de Janeiro where he performs regularly with Duo Violão Brasil and is preparing for the upcoming release of “Benjamim and Edinho” an inventive cross cultural collaboration with Ben Lamar Gay.